I decorate in stages. You? This was my first front porch photo for the season. I layered a boxwood wreath with a set of antlers we had lying in the garage for my door hanger, and threw out a few faux white pumpkins. 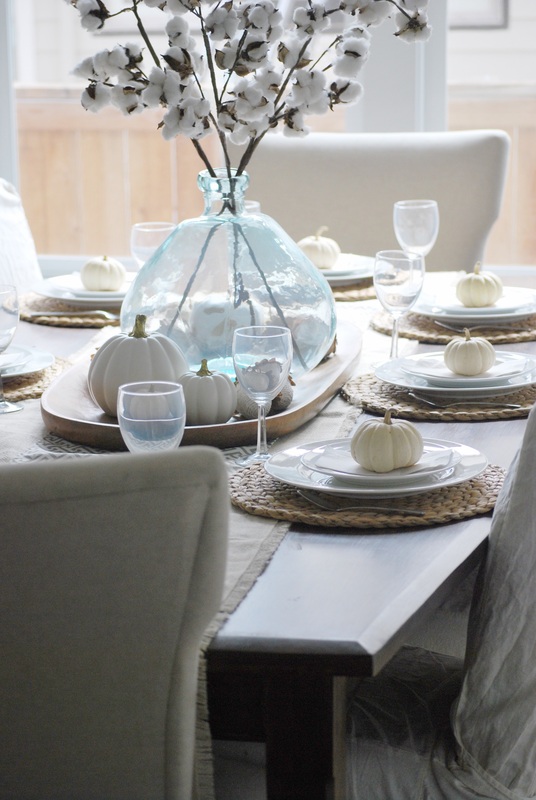 To throw together a Tablescape that was warm and inviting for fall, I added a few cotton stems in my favorite World Market vase! Next I picked up these cute, little, white pumpkins from a local farm while on a pumpkin patch field trip with my son today! (I won’t mention that I also purchased a few pumpkin donuts that didn’t make it home.) 😁 Lastly, I threw down my favorite IKEA placemats and a few classic, white pier 1 dishes… And voila! I am ready for our fall dinner guests.